New heavy equipment additives end radiator overheat, leaks, ends motor oil burning, restores power, smooth transmission shift, ends jerk, growl. Fast acting injector cleaner, pump lube stops black smoke. What's new in the way of equipment additives? A new breed of heavy equipment additives using Hi-tech chemistry end wear, residue, and leak problems - that down time, and expensive repairs once took care of. It use to be, you flushed your radiator with caustics, added fibers to stop leaks, and added a soluable oil to keep rust down. New flushes are none caustic; stop leaks are clear with no fiberous material; and anti-rust are non-oily and lower hi-temperatures. 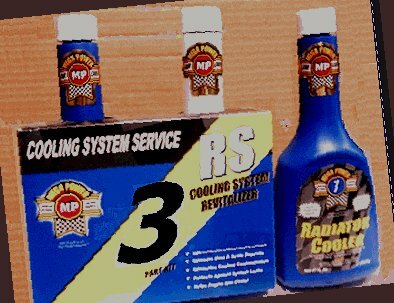 The Radiator Treatment from Mega Power leads the way with their Hi-Tech Radiator Treatment. Design to use when servicing your cooling system every 4 years. Any time coolant leaks or overheating appears. Cost As shown below - includes 3 items, for cars pickups: $40 plus $15s&h= $65 total. Buy 6 sets for $25 each. $150 plus $20s&h= $175 total. Cost For heavy equipment cooling systems. To 5 to 10 gallon capacity. $55 plush $15s&h= $65 total. For 6 vehicles: $225 plus $20s&h= $245 total. A few years back, all you could add to your motor when it needed a little internal help was a light-oil additive - I remember it has a cinnamon order and red color. Or, a thick, honey-like substance. Why you want to add a thickener to an already residue coated motor, requiering thin lube oil, I don't know. Today's heavy equipment additives are thin, absolutely remove excessive friction, clean and free sticky rings, and valves - and the fuel system, and new emission system - in minutes, to stop oil burning, leaks, valve tap, black exhaust smoke, and make diesels run quiet as a gas engine - and each ingredient is an anti-wear, promoting years more like-new power, performance, and greater fuel economy - Much better than older style heavy equipment additives. Leading the way with new Hi-tech additives: Mega Power. Shown below: The Mega Power Worn Engine Treatment provides truck and equipment owners all the above problem-solving benefits, and the best repair avoiding care anywhere. Customers tell us Mega Power never cost - as it more than pays for itself in fuel saving, and great pull power up hills in a higher gear. Imagine that working for you. Order today! Price As shown below. For cars and pickups: $65 plus $15 s&h= $80 total. 6 Treatments for 6 motors, $50 each. $300 plus $30s&h= $330 total. Price For heavy equipment diesel motors: 5 to 10 gallon oil capacity. $135 plus $15s&h= $140 total. For 6 HEMtrs: $85 each. $500 plus $50s&h= $550 total. Canada, Alaska, elsewhere, freigth as per your destination.